Maybe these aren't the 10 absolute best questions to be answered by Colorado high school cross country this fall, but they're questions that should be on your list nevertheless. 1. 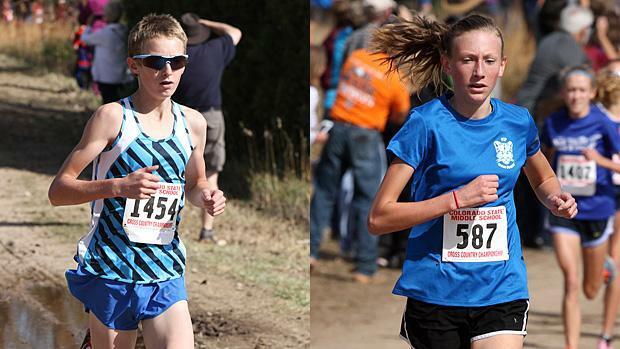 Which meet will be the winner in the Liberty Bell vs. St. Vrain showdown on September 12? Arguably, the calendar collision here is a blessing in disguise for both meets, but it remains to be seen which meet provides the better showdown of top teams and individuals. 2. What's life like for Palmer Ridge after Eric Hamer and Cherry Creek after Jordyn Colter? Early indications look good, but we'll wait to see what the season holds. 3. Who is your favorite in 5A boys? The individual title appears to be wide open going into the season, with perhaps a couple of stronger favorites, but several more in the hunt. And remember, the new state meet course isn't quite the same game changer that the previous state meet course was. 4. Where will the small school distance talent without cross country programs at their own schools end up this fall? It's probably the case that not all will end up running cross country, but Jennie Ann West, Luke Duggan, Morgan Crane, Micah Crane, Jackie Jerred, Bailey Fassler, and Taylor Cooney could end up helping somebody this fall if they find a place to run. 5. Can the Fort Collins girls hold off Fossil Ridge and Rocky Mountain within their own city another year? The Lambkins' dominance over local rivals has remained intact for more than a decade now. Is it time yet for the bill to come due? 6. Which will prove to be the most dominant program (boys and girls) within the state this fall. Mountain Vista has been strong for a few years running with boys now, and the girls program is showing signs of rising. Palmer Ridge snared a first (boys) and third (girls) at state last year. Alamosa swept the 3A titles last year. And, we know Lyons is always tough in both genders. Will we see anyone sweeping this fall? 7. Who will be this fall's freshman phenoms? Tyler Scholl likely has the inside track among the boys, and Quinn McConnell among the girls, but these things don't necessarily come out the way you think they will. 8. Speaking of Tyler Scholl, will it be West Grand or Middle Park (or someplace else?) for him this fall? We feel pretty safe in the belief that Quinn McConnell will be running for Peak to Peak this fall. 9. Can Colorado get a team back to NXN this year? If so, which team? 10. What will become of the Wiggins Invitational now that it's on a much more competitive weekend for meets than it has been previously?